4 miles south of Wroughton, near Swindon, Wiltshire. 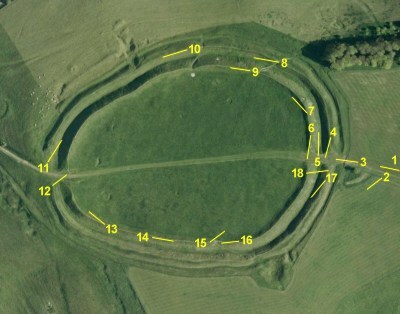 Barbury Castle is perhaps the most remarkable of the Ridgeway hill forts. Sitting 262 metres on top of the Marlborough Downs, it affords splendid views in all directions, despite the restrictions imposed by several tree lines, and, looking in a north-westerly direction, the neighbouring fort of Liddington Castle is visible on the horizon, as is Uffington Castle beyond it, on a clear day. Today, Barbury Castle is a designated country park, and the ground outside it is used as a picnic area and is well visited by the inhabitants of Swindon. The fort encloses an area of 12.3 acres, and is defined by a broadly elliptical double rampart, which, even after two millennia of erosion, remains quite steep and imposing. There is some evidence for a possible third rampart on the northern face, which was either unfinished or is the product of an early construction phase which was abandoned in subsequent developments. Barbury Castle was most probably constructed in several phases over a period of hundreds of years, perhaps beginning with a single soil rampart, then adding the second at a later date, as well as making both more steep and elaborate by incorporating chalk blocks into them, signs of which are still quite evident as one walks over the ramparts today. The dating of these presumed phases remains unverified as no serious archeological excavations have taken place at Barbury Castle. Indeed we have only the very vaguest of dates for the origins of the construction; around about the mid 1st Millennium B.C. There are two opposing entrances, east and west, which pass through the ramparts, although it is difficult for archeologists to understand precisely how these would have appeared originally due to military occupation of the fort during the Second World War; as a consequence of which the western entrance in particular was substantially widened, or perhaps demolished would be a more accurate assessment. The eastern entrance is very interesting as it includes a forecourt, bounded by a semi-circular rampart extending out from the main line of the fort. This feature, surely intended to strengthen the vulnerable eastern gate, is still clearly in evidence to the south of the path which leads up to this entrance, but its opposite to the north has been flattened from view by years of ploughing, although its faint outline can be seen on the aerial photograph below. Due to the manner in which this rampart connects to the main mass of the fort, it would appear that it was a part of an earlier development phase of the fort, rather than some later addition. As with its neighbour at Liddington, Barbury Castle has been a little misused over the centuries; flint quarrying has damaged the northern ramparts, and, during the Second World War, the dominant position of the fort was exploited as part of the local anti-aircraft defences, doubtlessly doing excellent work through the crisis of that time, but sadly scarring the fort by the aforementioned widening of the entrances, as well as the positioning of guns and the digging of trenches and such positions around the interior. Nevertheless this occupation did one fine, if quite unintentional archeological service; as a consequence of their digging, the troops uncovered archeological remains which have done much to define what we know of the Barbury Castle's history. Pottery dating to the Early and Middle Iron Ages was found, together with a hoard of iron tools, weapons, and vehicle fittings, dating from 300-1 B.C. From a later period, there is also evidence of Roman-era metalwork inside the fort, and pottery around the small mound outside the north-western rampart. Possible Saxon burials have also been discovered, together with weapons of that time; a knife, spearhead and a seax dating 5-700 A.D. Recent surveys have produced quite overwhelming evidence of life within the fort; pits and post-holes indicating either intensive occupation or, most probably, the results of urban regeneration with new buildings placed upon the old; the consequence of almost if not continuous occupation of the fort over its lifespan. As no pottery from the Late Iron Age has been discovered, it is believed that Barbury Castle, in common with its neighbours, was abandoned during the 1st Century B.C.